The Blog Tags block displays a word cloud (or list of words where font size visually indicates the frequency of use). The more frequently used blogs appear in a larger font size and least used in smaller fonts. The words will only appear if users add Tags (or keywords) to their blog entries. If no tags have been added, nothing will appear. *NOTE: You will need to do these steps if you do not see the Blog Tags block on your Moodle page. 2. 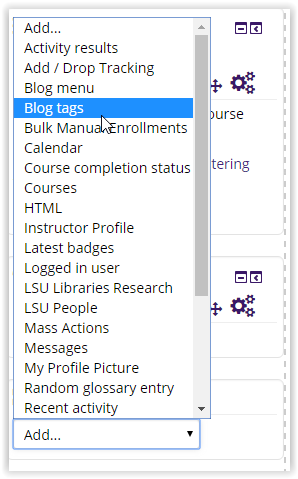 Select Blog Tags in the Add a Block drop-down box. 2. Locate the Blog Tags block and click on the Actions button. Select Delete Blog tags block.